In a southern Chinese boomtown, the neon glow of a busy warehouse scars the moonless sky. Workers attack the thousands of pairs of jeans piled on the floor with unweildy, motorised grinders hanging from the ceiling. The scrub shears layers off the denim to create a “vintage” look, and disperses a sticky blue dust that covers the workers’ skin and clogs their lungs. 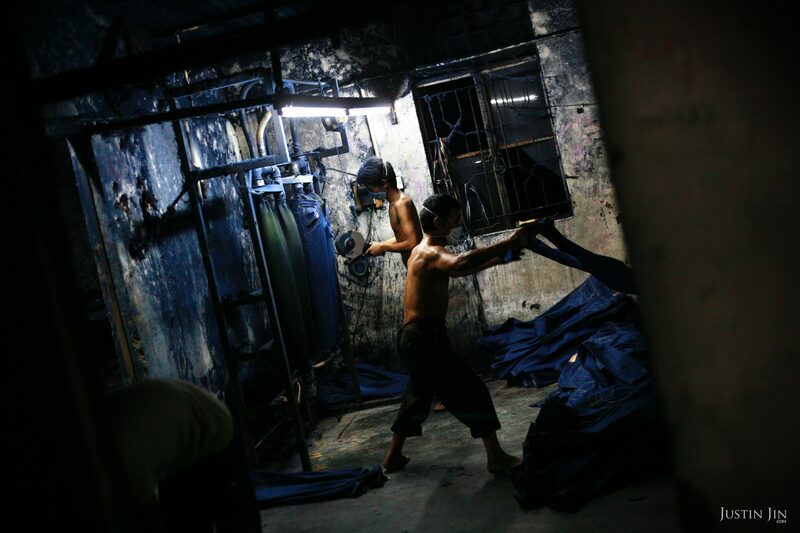 Laborers at this factory compete with the sunrise to scrub as many jeans as possible before morning pickup, when the garments will be packaged and shipped. Every scratch on the fabric is proscribed, the size, shape, and location imitating real-life abrasions. For every pair of jeans they distress, workers earn one euro cent. In another part of town, their boss Huang Yaohong shares a meal with fellow factory owners. The table is piled with half-eaten dishes of braised turtle, cold jellyfish, sizzling eel, grilled duck tongues, and salted prawns, among plainer dishes of chicken, fish, beef, and pork. When the waiter brings more bottles of 60-proof rice spirit and Red Bull, the bosses prepare for another toast. Mr. Huang, a short man with steely eyes, hoists his glass. “To the millionaires!” he exclaims. His tablemates rise to their feet. These bosses and their employees helped transform a sleepy backwater into a world-manufacturing hub, and made China the world’s biggest producer of jeans. They abandoned their impoverished villages in western China to seek a better living in the Pearl River Delta, a region in Guangdong province close to Hong Kong. They built an industry estimated to be worth tens of billions of euros annually, but at a bitter cost. Italian sailors in 16th-century Genoa wore the first jeans, made of a sturdy cloth and dyed with indigo. They needed pants that could roll easily and wear wet or dry. The sailors were said to launder their jeans by dragging them in large mesh nets behind the ship, with sea water and sun bleaching them white. The Italians dubbed the pants blu di Genova, which became bleu de Gênes to the French, and our “blue jeans” today. In America, Levi Strauss, a German merchant living in San Francisco, sold jeans to California’s growing mining population of the 1850s. Jeans gained popularity and, in the 20th century, became a universal symbol of rebellion and casual cool. Jeans are no longer worn for physical labor, but consumers still want their jeans to convey a used, rugged look. Distressing the fabric is outsourced to places like China, where cheap wages and lax environmental controls enable the rapid growth of a labor-intensive task soaked in toxic chemicals. Only a decade ago, this town was a loose amalgam of villages, duck ponds, and fields. Today, the region is a labyrinth of some 5,000 large and small garment factories the cover every aspect of the blue jeans production cycle, from weaving and dyeing to sewing and post-processing. The denim industry is so prevalent here that passengers convey their destinations to cab drivers not by street name, but by factory name. The thousands of workers who toil inside these factories do so at a substantial risk to their health and well-being. Some cloth is woven, and then dyed, but denim is made the opposite way. Workers, often without protection against caustic fumes, load the yarn into machines with open baths of “sulfur black” and other dyes (the darker the jeans, the more chemicals in the dye) and then treat it in caustic soda and acid to improve color absorption. After that, the denim is woven, cut to size, and ready to be sewn. Seamsters feed the heavy cloth through high-speed sewing machines for up to 18 hours a day. Their pay corresponds with output, on average reaching 150 euros a month, better than most workers in other industries. To meet the relentless production quotas, the seamsters risk repetitive stress injuries, eye problems, backaches, and industrial accidents. Workers typically labor every day of the month, with a few hours pause on payday. In one factory, a banner stretching across the canteen reads: “If you don’t work hard at your job today, tomorrow you would work hard finding a job.” Factories cram up to eight people into small dormitory rooms of 20 square meters and deduct the cost of their beds, electricity, water, and food from their pay. Conditions are just as dismal in the laundries. After jeans are sewn, they are treated with more chemicals at a laundry. Workers haul the jeans into giant washing machines, throwing bleach, enzymes, and a pumice stone into the tumbler to break down the indigo. At the end of the wash, workers pull out the wet load with bare hands and bring them to the drying area, where temperatures exceed 40 degrees Celsius. This constant change in temperature and humidity leads to arthritis and skin lesions. Laundry workers also suffer from the toxic fumes released by huge dryers. “You do this job for three or five years and leave the factory as a wreck,” says Li Hui, a 40-year-old laundry worker. About 90 percent of Chinese factories do not pay workers adequately for overtime, says Viederman. Buyers, Western brands included, impose unrealistic deadlines and low fees on factories, which in turn protect profits by shorting employees. Both factory and brand representatives collude by lying to labor inspectors and rewarding workers who tell auditors they don’t work overtime. “The system at this point embraces cover-ups. The brands and the factories know they have problems but there are very few incentives for them to work together to resolve them,” Viederman says. Despite the hardships, workers do stay. Dou Yongwen, 24, punched a button maker through his finger recently as his concentration lapsed late into his shift. He’s punched nearly 10,000 buttons a day, every day, for eight years. “It’s not life I’m living, punching buttons day and night,” says Dou. “But I’m trying to learn the trade and, hopefully, in a couple of years I will save enough money to open a button workshop. Huang Yaohong, owner of the factory that distresses jeans, achieved Dou’s dream. He grew up in the distant Sichuan province in western China, son of a poor farmer. He came here two decades ago, just as leader Deng Xiaoping began to reverse the excesses of Mao’s hard-line regime by targeting a few regions in southern China for capitalist experimentation. Huang, then 16 years old and penniless, left his village. “When I came to Guangdong, I was just another peasant and my dream was to have a warm stomach after every meal,” Huang recalls. With two shirts to his name, he took on exhausting, menial jobs, toiling through nights to earn a place to sleep. Through hard work, courage, and the sheer luck of being in China’s economic gold coast at a time of unprecedented industrial expansion, Huang became a business owner. He brought some family members to work with him, and soon, relative-by-relative, grew his workforce to some 80 people. Most orders come in at midnight and are collected at dawn. Huang’s factory can rough up 10,000 jeans per day, mainly for the domestic market. Revenue in a small factory such as his can reach 100,000 – 150,000 euros per year, with about 20 percent profit. “I never thought life could be as good as this. In China, if you have a million yuan (100,000 euros) you wouldn’t need to work the rest of your life,” says Huang. With disposable cash for the first time, the bosses can take time off to play cards, sing karaoke, enjoy a foot massage, or seek other pleasures. Indeed, theirs is a men’s world. Inside the restaurant, men talk business while their wives and children sit at an adjacent table. Rice spirit, beer, Red Bull and cigarettes are passed around endlessly, and it is anti-social to refuse. Huang’s mood runs high. “I’m on a lucky streak,” he whispers. Junior colleagues who spotted Huang from across the street flock to join him in the restaurant. Seated next to him is Wei Fang, a swaggering 40-year-old with a crew cut who owns a profitable, mid-sized jeans factory. Tonight, drunk on rice spirit and success, he shares his mantra with those eager to follow his path. “Invest, invest, invest,” says Wei, his index finger chopping the air with each word. When the New Year comes, traditionally the most important dates of the calendar, Huang shuts down his factory and sends his workers to join 200 million migrants returning to distant provinces on overloaded trains and buses. They carry with them things they did not have before – televisions, toys, and mobile phone accessories – giving their families a taste of urban glamor. Unlike his employees, Huang will not return to his ancestral village for the annual family reunion. He opts to celebrate his prosperous new reality. “We’ve come a long way, we’ve created our own destiny, and we’ve created wealth,” he says. “We dare to dream and we dare to do.